Our goal is to design and build exceptional quality structures, both structurally and architecturally, to meet the expectations of our customers. We strive to inform and educate our customers. Our on-site experiences allow us to share this product and knowledge with our customers, which aids them in making the right decisions. Many contractors quickly provide pricing, and can do so by overpricing or "padding" the margin. They build in excess margin to their jobs to compensate for poor budgeting and planning. While our pricing may at times take longer to determine, our customers can feel confident that their well thought out project with Distinctive Deck Designs will be competitively priced and an enjoyable experience. We appreciate you considering Distinctive Deck Designs for your outdoor living project. We welcome our customers to call, email, regular mail or fax any communications to us at anytime. We are ready to discuss your hopes and desires for adding value and a quality outdoor living experience to your home. We want you to know about us before we meet, so you can have confidence that you are working with a company that has strength, expertise, establishment, creativity and one with whom you can communicate. Our About Us Package also includes other essential details about what you can expect when working with Distinctive Deck Designs. This is a time for us to become acquainted and to discuss the details of the project. Our Quick Quote is intended to give an approximate price of your project, from start to finish, based on other projects we've completed with similar design requirements. Because every customer's project is unique and priced individually, a more detailed Final Proposal follows once the full scope of work is determined, customizations are considered and customer approval is obtained. At this stage, customers are assured of our clear understanding of their expectations, then acknowledged and approved. This is the best time to consider any and all changes to the scope of work. We provide a very detailed scope of work, fully outlining the construction process and material specifics. Once our customer accepts the scope of work, the project commences. We handle all state and county permit processes and provide much of the needed information for the HOA requirements. Our pre-production meeting is our opportunity to prepare you for the commencement of the build-out phase. 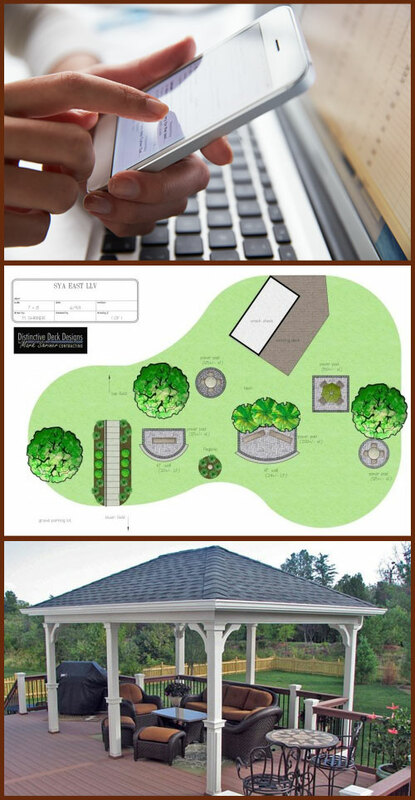 We may make certain instructions or suggestions that will enable better workflow while working on your property. Our Pride & Joy: Carpentry Expertise, Technology, Quality Materials and Unsurpassed On-Site Management come together to deliver the completed outdoor living project - your Distinctive Deck Design.